Top 12 Survey Sites That Pay in Restaurant Rewards - Get Free Food! Home » Top 12 Survey Sites That Pay in Restaurant Rewards – Get Free Food! If you like to dine out frequently, then restaurant gift cards can definitely help you save some money. Combine taking fun surveys with the ability to work on your own time with a flexible schedule and getting rewarded with free food, and it’s like a dream come true! Online survey panels usually offer some sort of food gift cards to members because they like to give variety in their prizes. You’ll see that most panels tend to offer a choice of PayPal cash, Amazon gift cards, and then a popular restaurant gift card, like Starbucks, to have rewards that appeal to just about every panelist. Restaurant cards are a popular option for people who like to get out once in a while with friends or family and enjoy a meal they don’t have to cook. Personally, I love having restaurant gift cards as an option because I can gift them to other people! I sometimes use my survey rewards to earn gift cards that I can gift to others for anniversaries, holidays, and birthdays, and restaurant gift cards are much more personal than just giving cash. Some of my favorite panels also offer gift cards to restaurants I love, and it’s fun to be rewarded with a nice meal out with my family. If you want to do the same, this post will have all the information you need! You’ve probably noticed that PayPal cash is one of the most common rewards that survey panels offer. That’s because it’s versatile – you can use the cash anywhere that accepts PayPal, and anywhere you choose when you transfer it to your own bank account. Of course, your PayPal cash you earn from surveys can go toward your grocery bills or your monthly budget for dining out. But, maybe you don’t have a bank account to transfer your cash to and aren’t eligible for one of PayPal’s debit cards. Or, maybe you wanted a specific restaurant reward to gift to someone for their birthday. In these cases, PayPal cash won’t cut it. You’ll want a restaurant gift card instead. Most survey panels offer some type of restaurant gift card (Starbucks is probably the most common because it has locations all over the world). This is a way for them to bring in more panelists who might prefer food rewards over other gifts. Most of the time, they’ll be in the form of gift codes that the panel will send to your email inbox within a week or two of you redeeming your points or cash from surveys. You can then use these codes when you visit the restaurant by showing your email to your waiter or waitress or printing the email and bringing it with you. Some restaurants only give physical gift cards, so depending on the card you choose, you might have to wait a little longer for your card to be mailed. Below are some of the most common gift cards for survey sites to offer that can help you score some free food for your time taking surveys online! You might not automatically associate Walmart with food, but most Walmarts are now super Walmarts, meaning they have a full grocery section available in them. If you’re fortunate enough to live near one of these, then your Walmart gift card could come in handy for buying groceries. Walmart, of course, has plenty of other things to buy – just about anything you could need for your home – so choosing a Walmart gift card can give you a lot of options. Target is similar to Walmart, stocking everything from household cleaning products to clothing to meats and dairy products. Target gift cards are rarer to find on survey sites than Walmart cards, but some panels do have them in denominations from $5 to $50, and they can come in handy for your household grocery shopping. Starbucks is, by far, the most common restaurant-specific gift card you’ll see as a reward on survey sites. It’s a very popular option for a lot of panelists who frequent the coffee shop, but it’s not practical for everyone. People in small towns don’t usually have a Starbucks nearby. However, the benefit of Starbucks cards if you’re a frequent customer is that they can come electronically and you can add the codes to your Starbucks Card to keep all your rewards together. Dunkin’ Donuts is another common restaurant gift card, but these restaurants locations aren’t in a lot of midwestern areas of the United States. If you love coffee and donuts, though, this could be a great option for you if you live near one! You can redeem your codes via the mobile app, which you can also use to pay for your purchase on future visits. 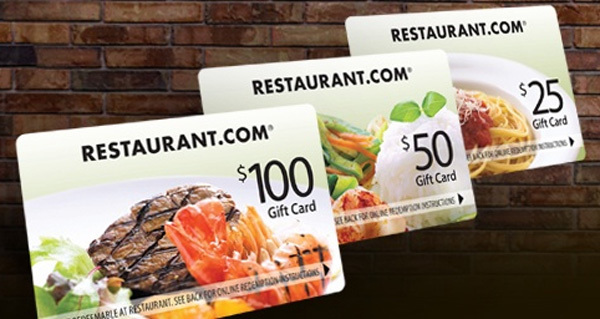 Restaurant.com gift cards are excellent options for people who like to try out new places to eat and for those who don’t have many restaurants nearby. These cards can be either physical or emailed and can be used at a variety of restaurants, so you can pick where you feel like eating when the mood hits. When you receive a Restaurant.com gift code from a survey site, you can visit Restaurant.com, plug in your zip code or city, and find participating restaurants in your area. Show your waiter/waitress your deal and enjoy your meal! One of the newer food reward options at some sites is Whole Foods. Whole Foods is a great place for grocery shopping, especially if you love only the best produce, meats, and healthy food options. Amazon.com is one of the most versatile rewards you can get from taking surveys online, and it’s also one of the rewards that most sites offer! Did you know that you can purchase food on Amazon? If you have a Prime membership, check out PrimePantry, which lets you load up a box of food for one low delivery price, and includes everything from snacks and drinks to pantry staples. You can also use your gift code balance to take advantage of AmazonFresh, which is available in major cities. This service delivers groceries to your door the same day or the next day after you order them through the site. Some panels now offer Sam’s Club gift certificates, which can be great for large families or businesses that need to order things in bulk. Usually, you can redeem points or cash for a minimum $25 Sam’s Club gift card. Tango offers a different way for you to get the restaurant gift card you want if you can’t find a survey site that has it. Several panels are now offering Tango cards because they let you pick what you want. Redeem your code on the Tango website and browse its list of partnered retailers that you can choose for equivalent rewards. You’ll get your chosen code instantly via email! Survey panels with extensive digital reward catalogs tend to have a lot of restaurant-specific gift cards to choose from! In most cases, you can browse the full catalog before you even join to make sure your favorite restaurants are options. If you can’t see the catalog, you can always contact the site and ask for a list of rewards before you join. If you want to know the best survey panels that offer food-related rewards, look no further than the following list! Swagbucks is one of the most popular GPT sites with paid surveys, games, cash back shopping, emails, and tons of other ways to earn points. Here’s a complete list of food-related rewards Swagbucks offers. Some require as little as 300 SBs for a $3 gift card, and there are a lot of unique options in the catalog that you won’t find on other survey sites. The full GlobalTestMarket rewards catalog is only available to members, but current members have talked about several restaurant gift cards being available as options. You’ll need the equivalent of $35 in your account to redeem a gift card from the catalog. Read more: Global Test Market Review: Great Idea or Beware? Similar to GlobalTestMarket, MySurvey doesn’t show all its rewards to non-members. However, it does have some of its popular options listed on its website, and it’s known for having a good range of choices. Cash out when you have $10 worth of points in your account. Read more: MySurvey Review: Can I Make Real Money Online? Formerly MintVine, Branded Surveys gives you points for each survey you complete. There aren’t a lot of reward option available, but it does give you some versatile options that can help you get some free food. You need 1,000 points to cash out for any prize, which you’ll usually get within 14 business days. Read more: Branded Surveys (MintVine) Review: Does It Live Up to The Hype? A popular and long-running survey site, E-Poll has the basic, most popular options available for food-related rewards. Most surveys pay between 500 and 1,000 points, and you’ll need a minimum of 3,750 points to redeem for any reward. Read more: Epoll Review: Fun Entertainment Surveys or Big Scam? InstaGC is a Get Paid To site that not only offers paid surveys, but also cash back shopping, paid videos, paid web searches, paid games, and more. It also has an extensive rewards catalog with plenty of restaurant options to choose from! You need a minimum of 100 points (worth $1) to cash out for some prizes, but most restaurant cards will require a higher minimum balance. Read more: InstaGC Review: Can You Really Earn Like They Say? One of the most popular panels on the net, Ipsos i-Say has frequent survey invites that keep you busy and earning cash. It offers the basic, most common ways to get some free food, but panelists love it for its quick, reliable payments. Read more: Ipsos iSay Panel Review: How Much Can You Really Make? This panel pays in cash instead of points and usually offers $3 or more per survey. You can choose from a variety of gift cards, or even cash, as rewards. Most rewards require a minimum of only $3 to cash out and will arrive within a few hours to your inbox! Read more: Pinecone Research Review: Why It’s the Best, or Is It? Earn $5 just for signing up to PointClub, a survey site that also lets you try to win points through its Daily Points Giveaway. PointClub is one of the few sites that offers Tango cards. You’ll need $25 worth of points to cash out for your favorite gift card. Read more: PointClub Review: Can You Trust What You Read? MySoapBox is another panel that has some great dining options for people looking strictly for restaurant gift cards. There are plenty of unique choices to suit all taste buds. Your first gift card redemption will require you to have a minimum of $25 in points in your account, but after your first successful redemption, you can cash out with only $1 in points. PrizeRebel is a GPT site with a whole lot of options for food lovers! Check out its amazing catalog of prizes before you join. You can redeem some for as little as 300 – or $3 – in points. …and many more restaurant-specific cards! YouGov is a great place for voicing your opinions on social and political issues, but it also has surveys related to new products, services, and other fun stuff. Gift cards require a different number of points to redeem, and most restaurant gift cards need 60,000 points or more for a $50 card. Read more: YouGov Paid Survey Panel Review: What’s It All About? Be on the lookout for scams! In the online survey world, you’ll, unfortunately, find a lot of scam artists that target people like you who want to make some money online. You might get emails that look legitimate and claim that you can take a free Starbucks gift card survey and get rewarded the same day. Or, you might see something similar in an advertisement on a website. Survey sites don’t work like this. You need to be a registered member to receive invites, and there’s no guarantee that you’ll qualify for every survey you try to take. If you see something that’s guaranteeing a prize, it’s probably not from a legitimate site. Survey sites reward you in cash or points, rather than a gift card, for completing a survey. You’ll need to save your points or cash balance until you reach enough to redeem for the gift card you want. Make sure the emails you’re responding to are from sites you’re already a registered member of and don’t click on any links or ads from email addresses you don’t recognize. Now, you’re ready to start getting gift cards to your favorite restaurants (or even gift cards that can help you pay for groceries!) just by taking online surveys.